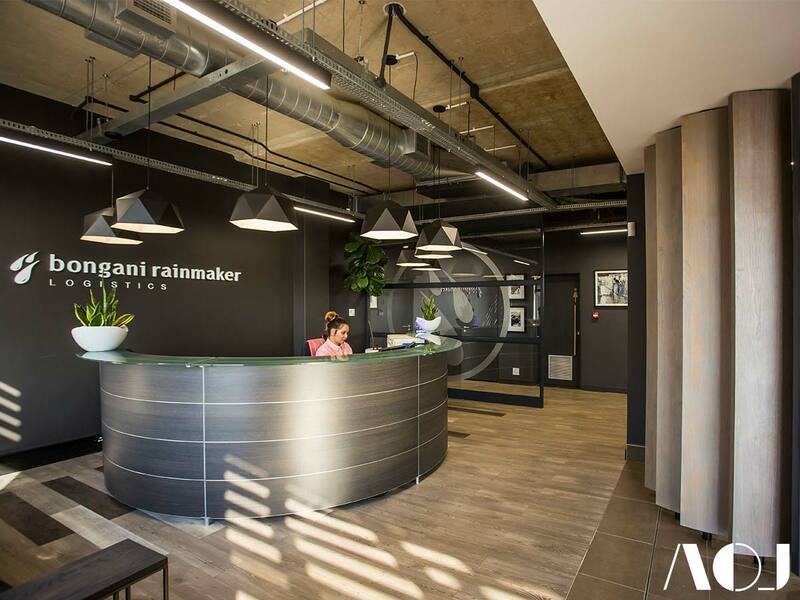 When Bongani Rainmaker Logistics, a successful service company with extensive logistical expertise, had outgrown its premises, the company consulted AOJ to assist with its new office interior. 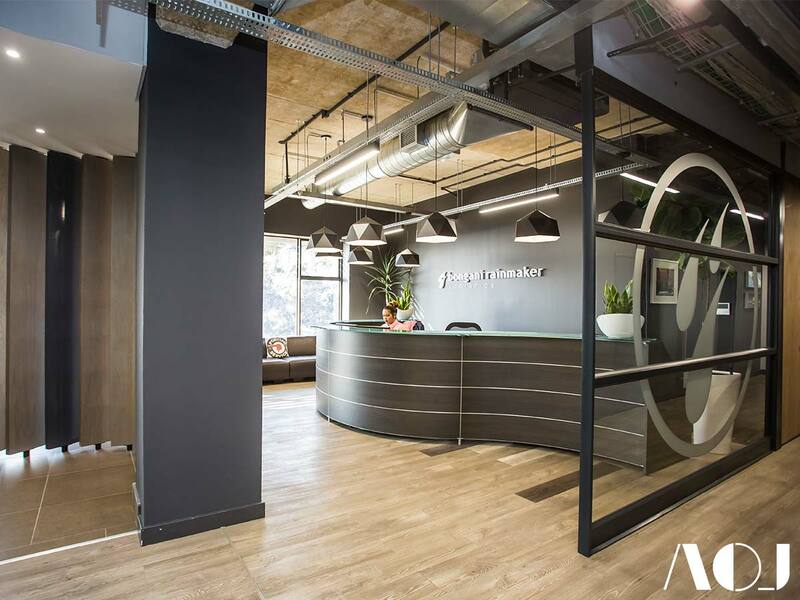 Having been the designers responsible for the previous offices, we had existing knowledge of the company and its ethos and were well placed to match the client’s needs with a modern, functional design. 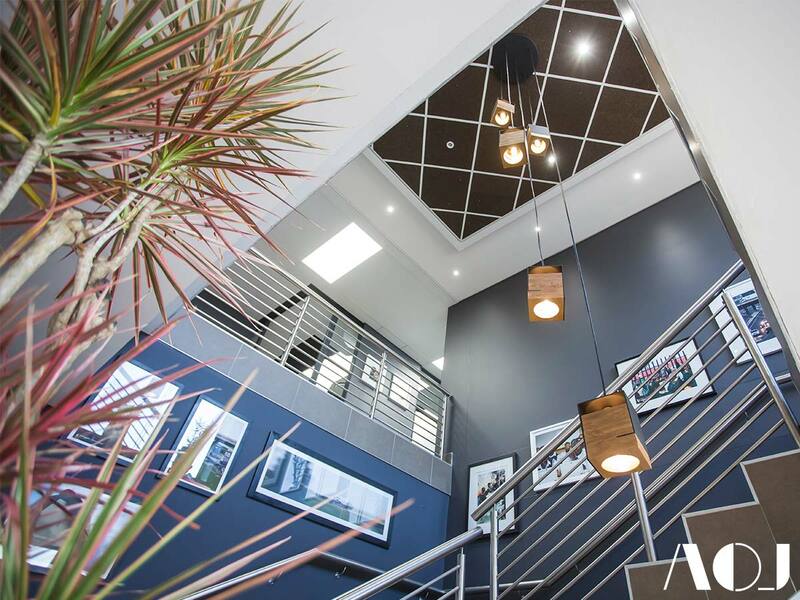 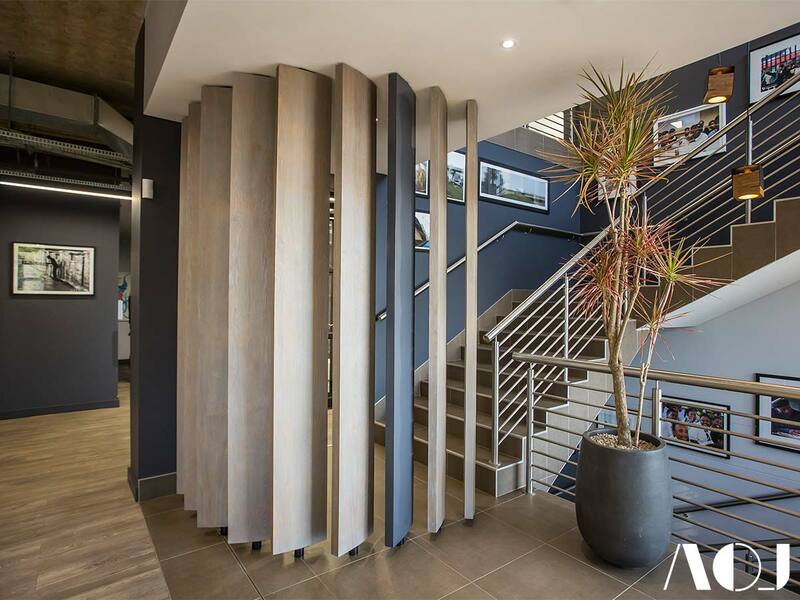 The initial design idea of AOJ and the tenant, when viewing the raw interior and exposed services and concrete at the premises at Westlake View Logistics Park in Modderfontein, Gauteng, was to implement an ‘industrial chic’ look in the more public areas of the building, such as the reception area and the call centre, and then, as one moves upstairs to the legal and financial departments, along with the director’s offices, present a more standard, corporate look and feel. 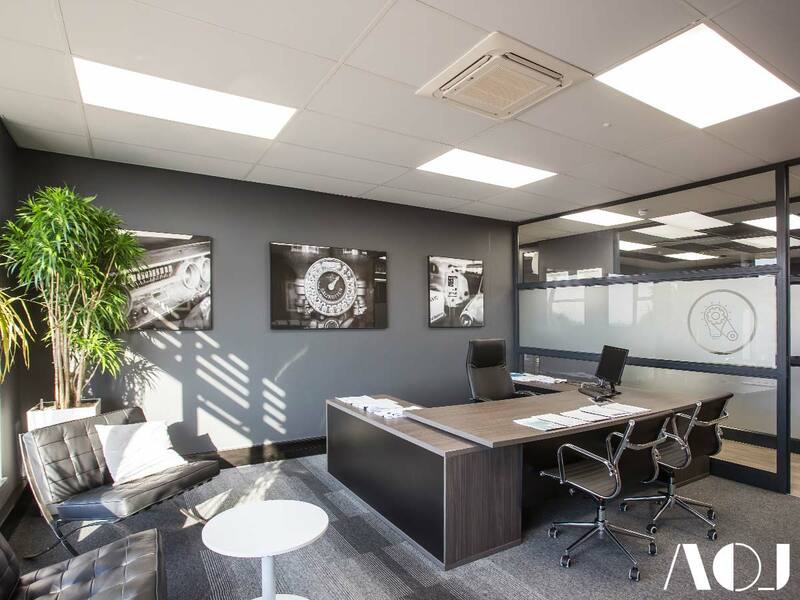 AOJ began the process with a breakdown of all of the company’s operations and business requirements. 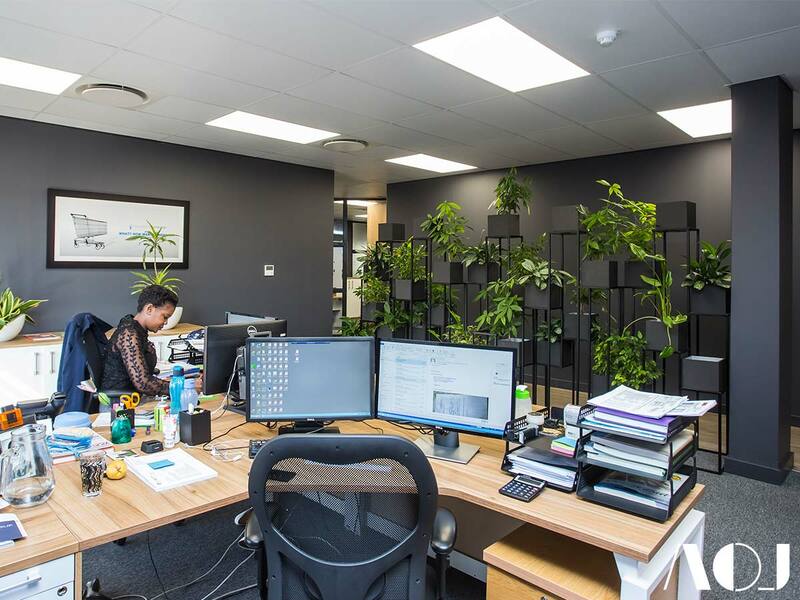 In total, across 1300m² of primary office space over two floors, 70 staff members are accommodated on the lower level (including eight private offices), and 30 staff on the upper office level (including nine private offices). 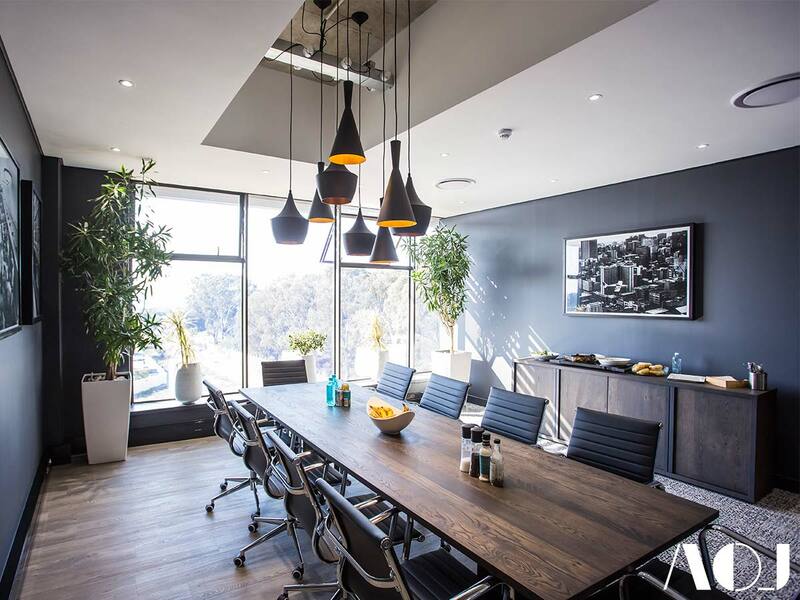 A reception, meeting rooms, main boardroom and executive kitchen were also included. 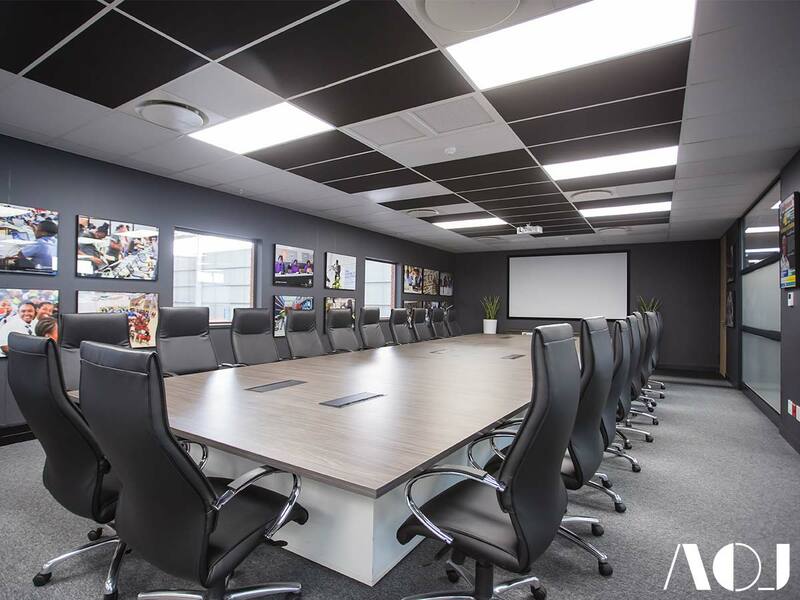 Furthermore, 1000m² of operational office space for 70 staff is located in the warehouse, comprising individual offices, open plan offices and a 100 seater conference facility. 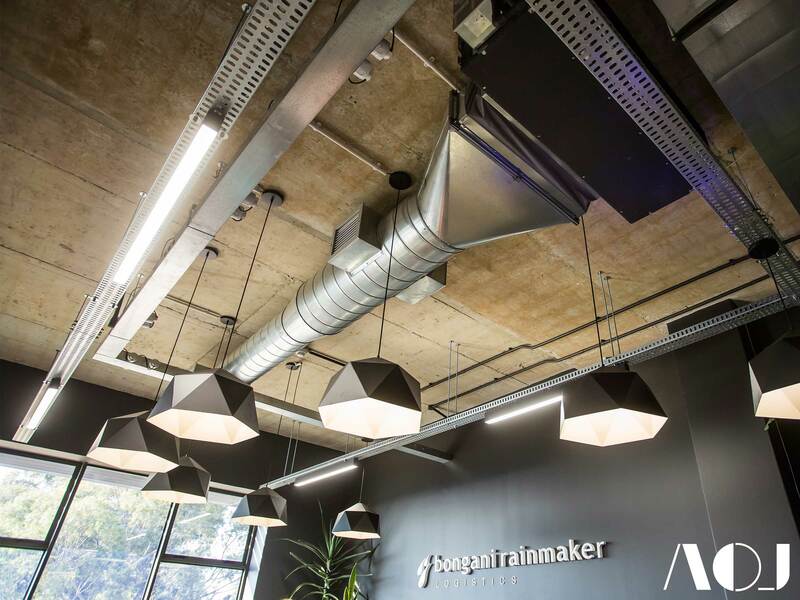 For the warehouse component, AOJ created operations offices on the warehouse floor, as well as offices on a central mezzanine level to give the managerial staff a birds eye view of the warehouse activities.” says Rassmann. 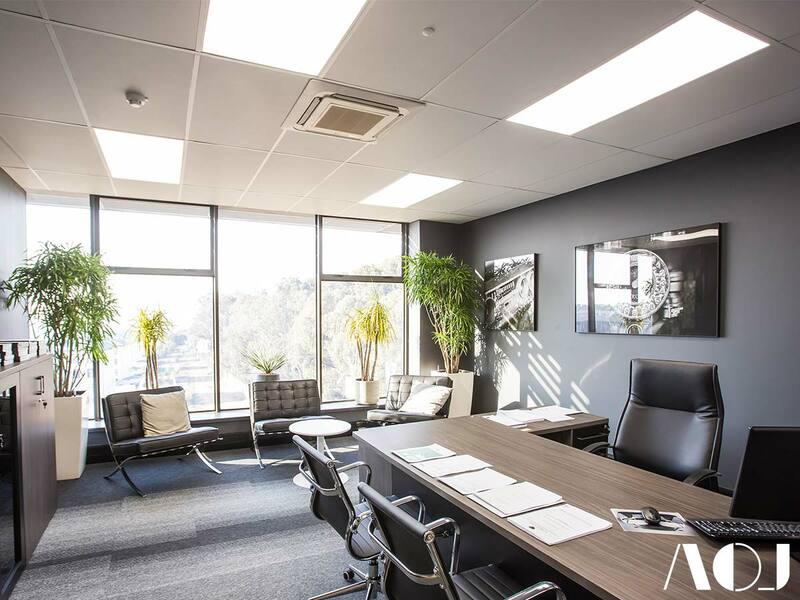 Due to the short timeframe of the project, an interior design firm, On Target Interiors, was brought on board to assist which allowed AOJ to focus on the space planning of the project and the basic look and feel, and the interior designers were given certain spaces and aspects of the project, such as the accent lighting in the reception spaces and boardrooms. 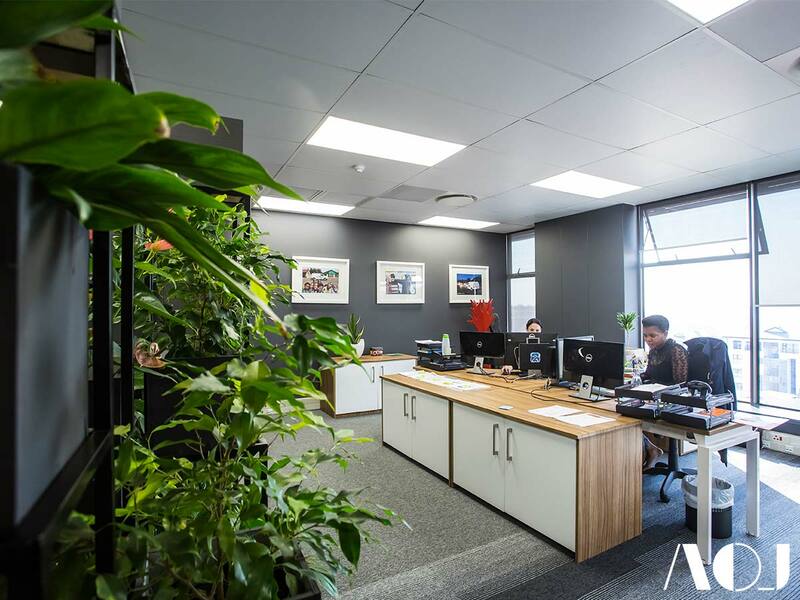 From a sustainable point-of-view, AOJ installed motion sensors and LED lighting in all the spaces, as well as a low energy air conditioning system. 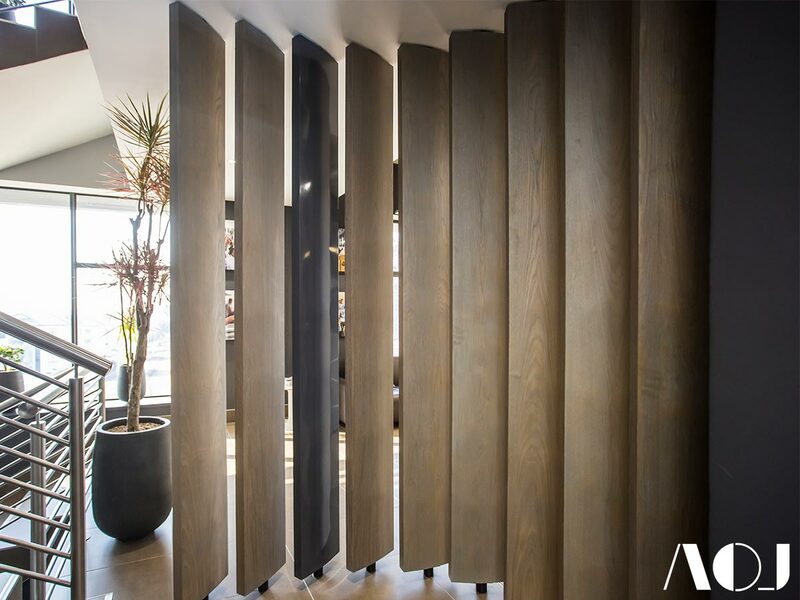 Hard-wearing and easily replaceable materials were used, along with a strong element of re-use. 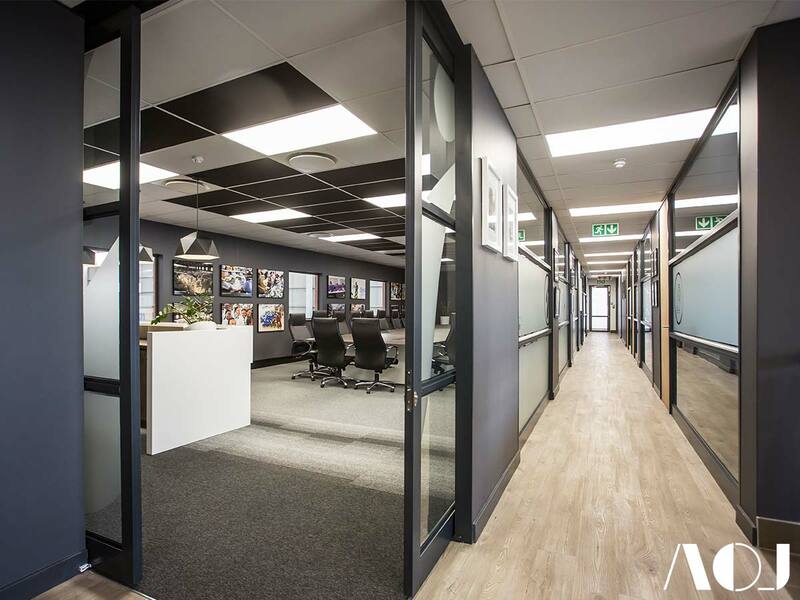 A demountable glass partitioning system, that the tenant had begun using in their previous offices, was incorporated into the project, and a large part of the partition design was to calculate the proportions of the partitions so they could have the best reuse in future offices of the company. 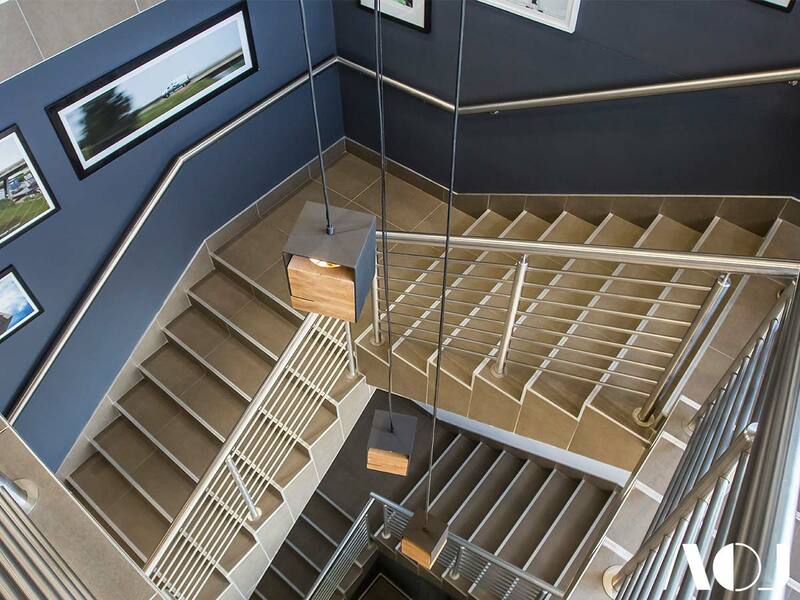 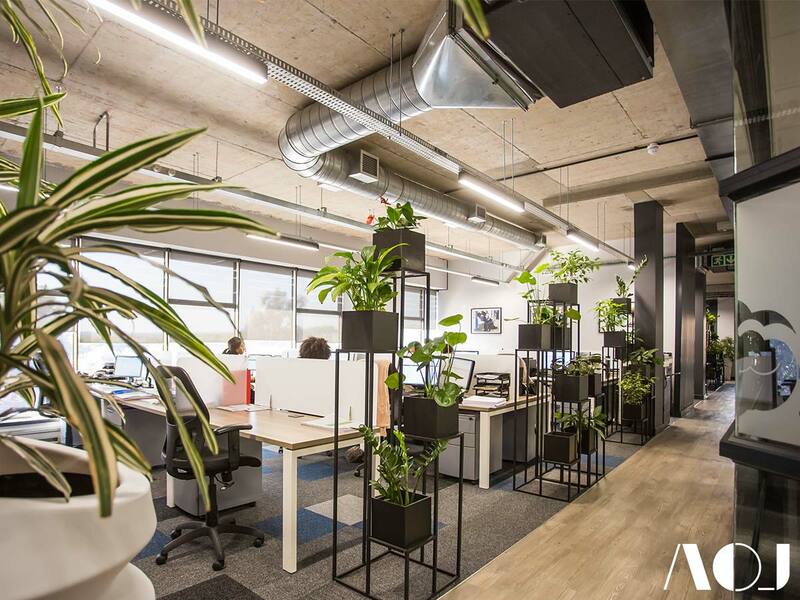 Despite a tight time frame, the joint design team of AOJ and On Target Interiors delivered a modern, industrial inspired interior to the offices of a company which has not only grown its staff complement in recent years, but also shifted its business focus.